I am intending to write more about Pope Paul VI but wanted to offer some thoughts about this new film. I saw it yesterday (my day off!). I recommend it. In a way it seems almost unbelievable that in this very secular and spiritually disordered age we should have movies that contain obvious, reasonably orthodox, spiritual themes. Like many facing death, the heroine of this story begins to think about the possibility of God. The script handles this in a very honest and sympathetic way showing that, when it comes to it, so much of the nonsense that people spout against religion means nothing. At some point in our lives, either now or later, most of us realise the truth of Newman's adolescent experience when he became aware of two existent beings - himself and God. Apart from the spiritual themes and the struggle for survival, the special effects are the best I have ever seen in any film. They do not distract from the story but enhance it. 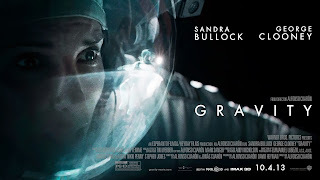 I suppose this is what will gain the film one of its Oscars at the next round, but I hope the acting of Sandra Bullock will be properly honoured as well as the wonderful script.